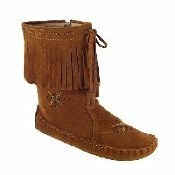 Women's Knee-Hi Prairie Boots, cow suede upper and fully leather lining, lightweight rubber outsole and padded insole, 3-Tier suede fringe, Rear-Zip closure. 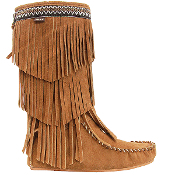 Women's Peace-Mocs Mid-Calf Fringe Boot with lightweight rubber sole, Fully Lined, Inside Zipper, and padded insole. 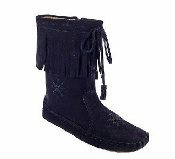 Women's Peace-Mocs Ankle-Hi Fringe Boot with lightweight rubber sole, fully lined, and padded insole.